It is a still image collection of single lens reflex shooting of 24 million pixel class. 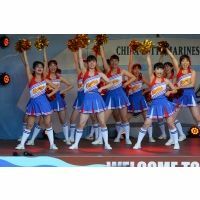 It is a very popular private JD Cheer Cheam acting in Chia loving neighborhood. Popularity has exploded and now most of appearances are forbidden to shoot. It is a performance that appeared in such an invaluable 2016 shootable event. Rare chests and cheerful high kicks by active JD etc. Rare & royal road points are firmly held! It is! looking forward to! It is! Everyone of Chiafechi, you are recommended! It is! I can understand "Hair 1 Hair" and "Costume Texture"
In order to enjoy high image quality, we will offer you with the shooting size as it is! It is! In addition, this product consists of 2 parts. If you do not mind, please have a look elsewhere. ※ In addition, this product will be a reappearance of past products with the same name that received a great popularity. Please note those already purchasing. * The subject has already been accepted at the event that shooting is permitted. * Reproduction, resale, publication etc. of movies and images of the author's work, and secondary use are prohibited at all.